Some masterstrokes and lots of loose endings & confusions. Didn't work for me. I love and hate horror/thrillers. I love the story and intensity of emotions they evoke, but hate that for a week I have to sleep with the lights on. And I get scared very easily, but The Shining didn’t do much for me. Jack Torrance (Jack Nicholson), an ex-school teacher and aspiring writer, gets a job as a winter care-taker at the Overlook Hotel which’d be isolated for months due to heavy snowfall. He moves in with his wife – Wendy (Shelley Duvall) – who looked like a dumb-drug-addict and his son Danny (Danny Lloyd) who has supernatural abilities to see things in the past and the future (The Shining), he also had an imaginary friend called Tony. Out of nowhere, Jack starts to lose his temper over trivial things and Danny is haunted by visions of two girls. Things get nasty when one day Jack is shouting in his sleep, Wendy comes running for him and Danny returns bruised and won’t recover from the shock from something that happened in Room 237. Wendy logically concludes that Jack did that to him while he was asleep. In the end, Jack goes nuts and tries to kill everyone. Some scenes of his attack even made me chuckle. Set in a huge hotel building, the film is a little slow-paced but that does a great job of keeping the thrill alive, you never know what to expect. And also gives a fair feel of how lonely it must be in that hotel, and how slow the time passes. The only creepy thing about the film was the music which adds a fourth dimension to the setting. You never know when things are supernatural or the mind playing tricks (cabin fever). It was also nice of Stanley Kubrick to add visual drama details with those trippy carpets, voice modulations, eye moments, and (most important) Jack’s eyebrows! The scenes with Danny riding is little bike over them making that sound were a masterful touch. There wasn’t really a horror or shock, just the setting playing it’s tricks to keep you guessing and creeped out. But by the end of it I was more confused and meh-ing. For starters, so many questions were left unanswered: What was with the blood flood? What’s with the God-sent Mr Grady who rescue Jack when Wendy locked him up? 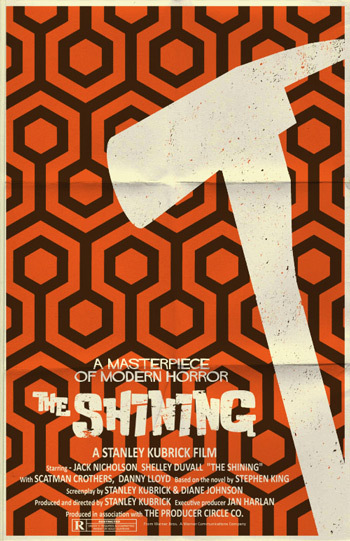 what’s the point of ‘The Shinning’ (Danny’s supernatural abilities) which didn’t really help as such. The only ghost that displays ability to have any physical effect is Mr. Grady, the butler, and he displays it only once. When unlocking Jack. Hallorann (Scatman Crothers), the cook, returns to find out what’s happening but servers no purpose other than providing the escape vehicle. Now if I was over-thinking, I’d shout Deus ex Machina! But I won’t. Hallorann could use Shining to know something is wrong in the hotel but not foresee Jack waiting for him, given that his telepathic partner, Danny, is aware of it and very scared at that moment. What was the whole point of having supernatural abilities? What did it add to the overall story? One more guy going nuts? Or getting an escape vehicle in the end? Or being more horrified? The only faint point where it helped was when Danny writers ‘REDRUM‘ on a door and Wendy sees it as MURDER in the mirror at the right moment and manages to lock Jack out. What was the motive of the ghosts? By the end we are sure they are ghosts and not just a disorder because Wendy sees the same sort of ghosts. What were they trying to do? Yeah, I am nuts like that – trying to find their motive. Now I understand that everything doesn’t need a reason, and I even understand the value of symbolism. But so many loose-ends, open to interpretation don’t cut it for me. It did keep me hooked, I did enjoy it but wasn’t satisfied in the end. Perhaps it has aged. Or something is wrong with me. Published on September 17, 2013. Updated on October 11, 2013.